Everyone knows the importance of being active, but it’s the kind of activity you choose that’s most important. While aerobic training is beneficial for endurance and weight control, it doesn’t strengthen your muscles. As you age, your muscles naturally deteriorate, and it becomes imperative for you to get stronger. Along with being a necessity, strength training – also known as resistance training or weight-lifting – has an overwhelming amount of additional benefits that contribute to your overall quality of life. In a recent 12-month study conducted by Tufts University on postmenopausal women, simply strength training twice a week increased their strength by 75 percent, and they had a 13 percent increase in dynamic balance. According to the Centers for Disease Control and Prevention, strength training benefits women and men of all ages and all levels of fitness. Even if you have a disability, once consulting your physician, strength training can be particularly beneficial for you. The reasons to ensure that you have a strength training plan in place as you age are significant. The older you get, the chances of falling, contracting diseases and chronic conditions, and losing energy and strength get higher. Strength training works to combat the signs and symptoms of existing health problems and can prevent you from developing other conditions. Poor balance and coordination are two of the biggest contributors to falls and broken bones. As a secondary benefit to growing stronger, strength training exercises can easily correct balance and coordination issues, allowing you to perform motor tasks more smoothly and accurately. Based on the results of a recent strength training program at Tufts University, older men and women with moderate to severe knee osteoarthritis found a 43 percent decrease in pain at the end of 16 weeks. For the men and women in this study, the effectiveness of strength training was just as effective, if not more effective, than the medicine being taken for their osteoarthritis. Strength training has also been found to improve patients’ suffering from rheumatoid arthritis by reducing stiffness and pain. As you age, you naturally lose bone mass and density, widening the door to fractures and falls. Weight-bearing exercises can be very important to prevent or decrease the progression of osteoporosis. Muscles pull on bones, so the more stress you put on your bone, the stronger it can become. Muscle, an active tissue, burns calorie. Stored fat, in contrast, burns virtually nothing. As you grow stronger, your metabolism increases and burns more calories, helping you with weight loss and long-term weight control. Strength training contributes to a leaner, overall healthier version of yourself, which reduces the risk of heart disease. 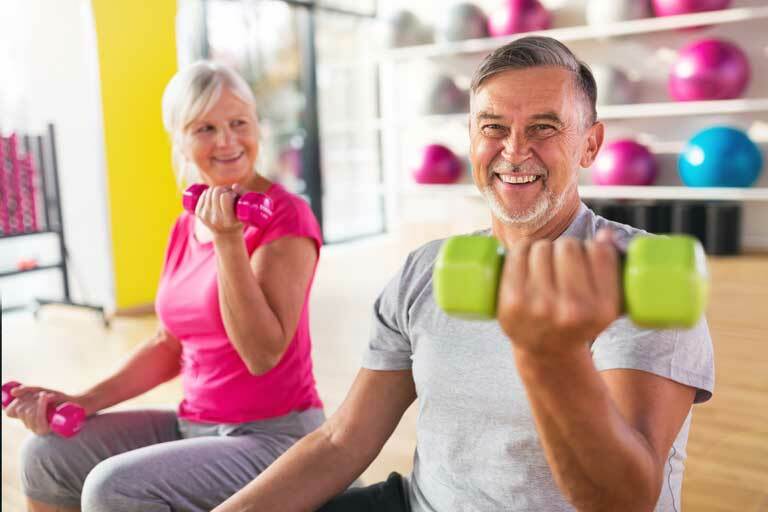 The American Heart Association recommends strength training not only as a way to reduce the risk of heart disease, but also as a part of therapy for cardiac rehabilitation programs. The number of Americans with Type 2 diabetes is steadily climbing. Because diabetes lends itself to so many onset health problems, such as blindness, heart disease and renal disease, there is a great need for either preventative action or combative action for those with the disease. Strength training can produce significant improvements in glycemic control, significant enough that some studies have shown it to be comparable to taking diabetes medication. Back pain can be caused by a simple imbalance in total body muscles. Strength training can easily bring balance to your muscles, reducing overall pain and stress on the spine. Strength training, particularly when coupled with regular aerobic activity, can have a significant impact on mental health and emotional health; it reduces depression and improves one’s sleep, self-esteem and general sense of well-being. Plus, if you’ve been strength training, when you encounter injury, your body has a better chance of getting back to normal. Strength training can seem like a daunting task if you don’t have any experience – but there are many free resources to start you on the right track. It’s never too late to start growing stronger. By taking control of how you exercise your body, aging can become a sign of strength instead of weakness.